Have you ever wondered who the largest manufacturers are for Windows & Doors? Well, here the list that was compile by Window & Door publication. Everyone is familiar with Andersen but what about some of these other ones?? Take a look. Andersen and Eagle wood windows and patio doors. Renewal by Andersen composite replacement windows. Silver Line and American Craftsman vinyl windows and doors. Aluminum and vinyl windows and patio doors. Impact-resistant windows, patio doors, fabric and shutters. Acoustic windows. atio enclosures. Wood, vinyl, and aluminum windows and patio doors. Wood, steel, and composite entry doors. Interior doors. Aluminum and wood-core storm doors. Storm windows and retractable screen doors. Steel, wood, fiberglass and composite entry and patio doors. Interior doors, French doors, and bi-fold doors. Wood, vinyl, fiberglass window, patio door and entry door products, as well as steel entry doors. Efco architectural windows, curtain wall, storefronts and entrances. Skylights and roof windows. Wood, aluminum and vinyl windows and patio doors. Vinyl windows and doors for the new construction, replacement and impact markets. Commercial windows, doors, curtainwall and entrances. This entry was posted in Windows Info on February 6, 2013 by wrbkadmin. The Good – Casement windows open outward for light, fresh air and side breezes. They’re tightly sealed for energy efficiency and great for hard-to-reach places, such as over sinks and appliances in the kitchen. The Bad – If you’re moving into an older home, check on the stability of your casement hinges and hardware. Though casements are usually tough to break into, faulty or rusty hardware increases your risk factor. During windy weather, they are hard to open and close. The Good – Awning windows are designed to provide light and breeze. They’re great for bedrooms and other areas that need to maintain privacy but still let some light in. Awnings can be opened slightly to allow ventilation. The Bad – Screens for awning windows are set on the inside, which can mean that all the dirt and dust that normally falls into the sash makes its way onto your floors instead. The Good – Double hung windows are chosen for their unique style, ease of access and superior ventilation capabilities. The top of the window can be opened while the bottom remains closed. 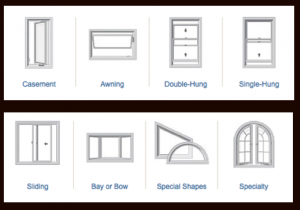 Double hung windows can go practically anywhere in your home. They’re perfect for kitchens, offices and bedrooms. The Bad - Double hung windows tend to leak more air than other windows. And keep in mind that only half of this window opens up, whereas different types can open completely. Tend to a problem in older homes. The Good – Single hung windows are chosen for their unique style, ease of access and superior ventilation capabilities. Single hung windows can go practically anywhere in your home. They’re perfect for kitchens, offices and bedrooms. The Bad - Single hung windows leak less air than double hung windows. And keep in mind that only half of this window opens up, whereas different types can open completely. The Good – Picture windows create unobstructed views of the outdoors. They’re best in areas where ventilation isn’t a big concern. Think about installing them high on the walls of dark rooms and hallways for infinitely better lighting. In combination with patio doors or open-and-close windows, picture windows bring the perfect balance of light and ventilation. The Bad – These windows are for looks only. And the large expanse of glass can make them more vulnerable to breakage. You cannot open these windows. The Good – Bay windows create an open, peaceful feel indoors. Their multiple views allow light to stream in from different angles. Plus, the sides of the window can be opened for air circulation. Bay windows dress up any home with uniqueness and style. Replacing a flat window with a bay can completely change the amount of light that room receives. They’re primarily used for kitchens, but can also add character to family rooms and master bedrooms. The Bad – Only the sides of bay windows open and typically don’t come with screens, so incoming pests could be a problem. Also, these windows tend to be very expensive. This entry was posted in Windows Info on January 22, 2013 by wrbkadmin. How to repair your window? Owning a home is great thing, right? But what do you when you window needs repair… who do you call or do you do it your self? I guess the correct answer is that it depends on problem that you are having. If you have a single pane double hung window that is leaking too much cold air.. you can definitely look into making the fix yourself. Also, if you have a torn window screen you can fix it yourself. Let’s take a closer look. If the glass of your window if broken, it’s time to call in the experts. We live in Brooklyn and for window repair Brooklyn, we utilize Airlite Windows. They have been in business for over 50 years and do a great job fixing your windows. Good luck fixing your window or call in the experts. This entry was posted in WIndow Repair on January 13, 2013 by wrbkadmin. Air Chambers – Small honeycomb spaces within the sash and frame which help to insulate and strengthen the window. Air Infiltration – The amount of air that passes between a window sash and frame. In windows it is measured in terms of cubic feet or air per minute, per square foot of area. The lower the number, the less air the window lets pass through. Awning Window – A top-hinged window that swings outward for ventilation. Bay Window – An angled combination of three windows that project out from the wall of the home. The windows are commonly joined at 30- or 45-degree angles. Bow Window – An angled combination of windows in 3-, 4- or 5-lite configurations. The windows are attached at 10-degree angles to project a more circular, arced appearance. Cam Lock and Keeper – The mechanisms which pull the sash together when placed in the locked position. Casement Window – A window with a side-hinged sash that opens outward for ventilation. Condensation – The formation of moisture on the surface of the window. Conduction – Heat loss in windows that occurs primarily through the edges of the glazing and through the sash and frames. Convection – Heat loss that occurs due to air movement between the glazings of a window. Dead-air space – The space between the panes of glass of an I.G. Unit. Desiccant – A material used in insulating glass to absorb water vapor which causes fogging. Double Hung Window – A window that has two operable sash which slide vertically. Drainage Holes – Small openings designed to allow water to escape that might otherwise accumulate in a window’s sill. ENERGY STAR® – ENERGY STAR® is an independent government program establishing a standard set of guidelines to recognize the energy efficiency of various products. ENERGY STAR® guidelines are used in conjunction with a variety of building materials, including windows and patio doors. Over the past ten years, ENERGY STAR® guidelines have helped double the efficiency of windows they endorse. Glazing – The process of sealing the glass to the sash. I.G. Unit (Insulating Glass Unit) – Two or more lites of glass separated by a spacer and hermetically sealed at the glass edges. Lite – A unit of glass in a window. Obscure Glass – Glass that has been made translucent instead of transparent. Picture Window – A window that has no moveable sash. Sash – The part of the window which contains the glass. Sill – The horizontal, bottom section of the main frame. Sill Extension – An extrusion that is attached to the bottom of the window to cover the gap between the sill and the rough opening. Slider Window – A window in which the sash move horizontally. Sliders are available in a 2- or 3-lite configuration, with the 3-lite having operable end vents. Solar Heat Gain – The percentage of heat gained from both direct sunlight and absorbed heat. The smaller the number, the greater the ability to reduce solar heat gain. Spacer – Material placed between two or more pieces of glass in order to maintain a uniform width between the glass, and prevent sealant distortion. Sweep Sill – A flexible fin usually made of rubber or polypropylene which is fastened to either the movable sash or the stationary frame and sweeps against the opposing component to form a barrier. Tempered Glass – Glass when broken, it breaks into pebbles instead of shards. Thermal Break – An insulating material applied to a high conducting material to slow the transfer of heat. Tilt Latch – Mechanism that unlocks the sash and allows it to tilt in from the main frame. Warm Edge Spacer – Spacers made from insulating material such as foam, butyl, thermo-plastic, or thermally improved metals and therefore conduct significantly less heat energy than standard spacers. Water Leakage – The penetration of water that would continuously or repeatedly wet parts of a building or components not designed to be wetted. If we’re missing something that you would like us to cover, just let us know. This entry was posted in Windows Info on January 12, 2013 by wrbkadmin.